Construction of a new launch pad for Europe’s Ariane 6 rocket, which sources say will likely be put together horizontally instead of vertically, is due to begin next week at an abandoned quarry site in French Guiana. 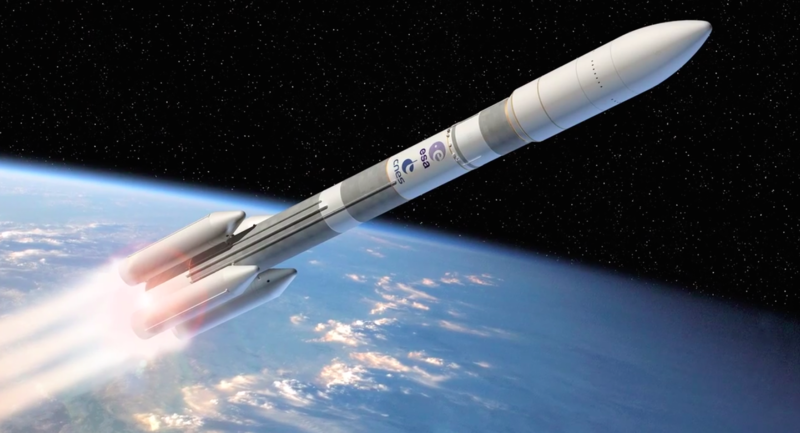 The launch facility is to be ready for the Ariane 6’s debut flight in 2020, and the complex will include a launch mount, flame trench and buildings to support assembly of the two-stage rocket, its solid rocket boosters, and satellite payloads. Officials said the preliminary plan calls for the Ariane 6 rocket to be integrated horizontally, a practice long used for Russian launchers and more recently adopted by United Launch Alliance’s Delta 4 rocket family and SpaceX’s Falcon 9 rocket. Two sources familiar with the Ariane 6’s ground systems said the two-stage core of the rocket will be put together on its side, but officials have not yet decided whether payloads will be added horizontally or vertically once the launcher is standing on the launch pad. A spokesperson from Airbus Safran Launchers indicated no final decision on the integration scheme. The integration method differs from Europe’s previous Ariane launchers. Like its predecessors, the Ariane 5 rocket is stacked on top of a mobile launch platform, with technicians adding boosters, an upper stage, and satellites while the launcher stands upright. The Ariane 6 pad will be built at a former quarry a few miles north of the existing Ariane 5 launch complex. The site is already partially excavated and filled with water, reducing the amount of work needed to dig a basin for the Ariane 6’s flame trench. 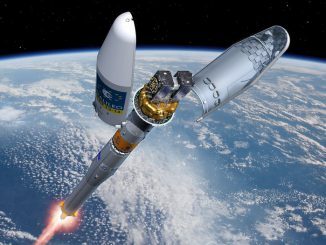 The European Space Agency plans to sign a multibillion-dollar contract in the coming weeks with Airbus Safran Launchers to finish development of the Ariane 6 rocket. The deal is expected to be arranged as a cost-sharing public-private partnership, with European governments contributing the bulk of the funding and Airbus Safran Launchers funding a minority percentage from its own coffers. CNES — the French space agency — is in charge of the Guiana Space Center, Europe’s spaceport on the northern coast of South America. It lies at approximately 5 degrees north latitude, close enough to the equator for launches to get a performance boost from Earth’s rotation. CNES announced June 19 it selected Eiffage TP, a French civil engineering firm, to start earthmoving work at the launch site June 29. The 14.8 million euro ($16.6 million) contract covers preparation of the site for roads and buildings and the excavation of rock and soil. The contract runs 12 months, but CNES says the majority of the work must be completed during the next six months to coincide with French Guiana’s dry season. CNES says the launch site covers 170 hectacres — 420 acres — and the construction requires 1 million cubic meters of material to be moved. The launch pad will be named ELA-4 — a French acronym for Ensemble Lancement Ariane — keeping with the naming conventions for previous Ariane launch zones. Eiffage TP plans to use use innovative soil treatment techniques using cement and hydraulic binder, allowing construction crews to use soil present at the launch site, CNES said in a statement. 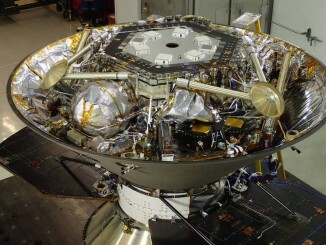 The technique reduces the need to transport soil and improves the carbon footprint and environmental impact during preparation of the launch pad. CNES touted the construction work’s local market impact. At least three-quarters of the work will go toward the French Guiana economy, according to CNES. The French space agency next plans to select contractors to build the launch pad’s support and assembly structures. Operated by Arianespace, which will soon be majority-owned by Airbus Safran Launchers, the Ariane 6 will come in two configurations to launch one or two large satellites at a time into low-altitude perches and geostationary orbits favored by commercial telecom spacecraft. The Ariane 6’s main stage will be powered by a hydrogen-fueled Vulcain engine based on the powerplant currently flying on the Ariane 5. 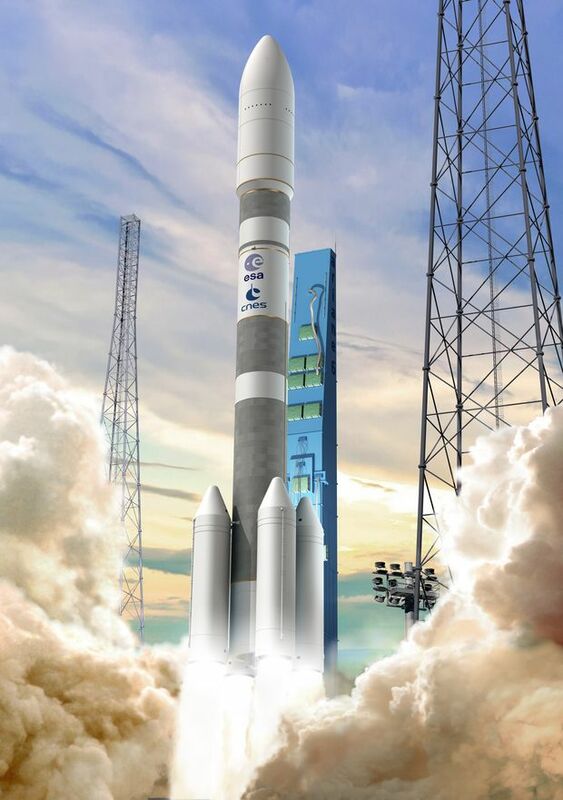 A new Vinci cryogenic upper stage engine is in development for the Ariane 6’s second stage. Depending on the mission, engineers can place two or four solid rocket boosters around the base of the rocket to help push the launcher off the pad. The more powerful Ariane 64 version of the rocket — with four boosters — can launch two large communications satellites at a time in a dual-payload configuration similar to the one currently used by the Ariane 5. ESA and its industrial partners have set 91 million euros ($102 million) as the target unit cost for the Ariane 64 version. If the rocket is sold at cost, two satellite customers could split the price for a launch at about $50 million each, a figure Arianespace expects will be competitive on the global market. 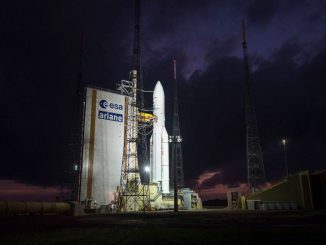 European leaders approved the new rocket in a ministerial-level conference in December as the Ariane 5 faced competitive pressure from SpaceX, which offers launches at lower prices than other Western companies.